Fredesvindo Covarrubias Jr leads the distribution of assorted school supplies, shoes and tee-shirts to deserving scholars of the Culianan Learning Center in Zamboanga City in Mindanao. 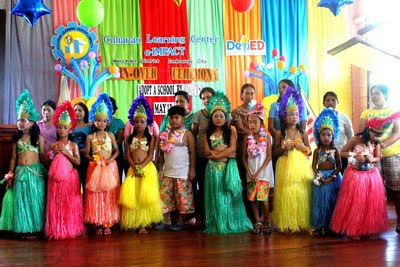 ZAMBOANGA CITY, Philippines (Mindanao Examiner / May 22, 2011) – Local party organizer By Gems Party Kingdom and the Culianan Learning Center have signed a memorandum of agreement to jointly support outstanding and deserving students by providing them school supplies and uniform. In a ceremony held recently at the Culianan Learning Center, By Gems handed over writing paraphernalia, bags, school uniforms, shoes and sacks, and tee-shirts to ten students who were also awarded certificates of scholarship. The ceremony was witnessed by Dr. Josefina Lacastesantos, the school principal, and Eloisa Bernardo, who is in-charge of the learning center, and parents of the new scholars. By Gems said the donation is part of its ‘Adopt a School’ program aimed at reaching out to selected schools in order to help train and develop potential students. Students will undergo 300 hours of on-the-job training starting this school year. In return, By Gems committed itself to hire talented students after their graduation or as part-time workers. 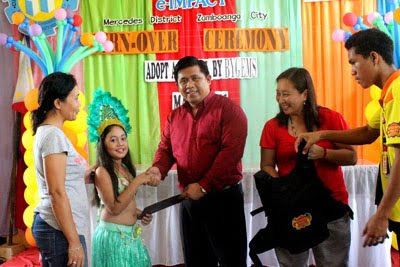 By Gems has been actively involved in different charitable activities in Zamboanga City, especially those that will benefit the poor, as part of its social obligation to the communities. 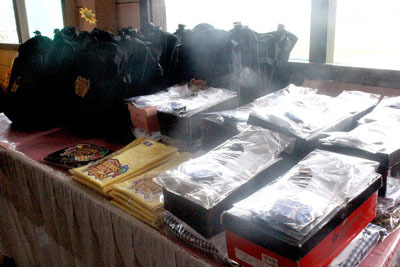 Throughout the years, By Gems has been very active in social works. By Gems is the leading one-stop-party shop in Zamboanga City and has a branch in Ipil town in Zamboanga Sibugay province.